Want to teach your student about atoms? How about matter? 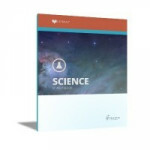 You're in the right place—because those are the topics in the LIFEPAC General Science III Unit 1 Worktext! This interesting, consumable Alpha Omega curriculum covers the phases of matter, radioactivity, the structure of the atomic nucleus, fusion, and fission. Print-based lessons and tests are included.